During the past year, I have written increasingly about the major strides made for positive recycling and reuse, reform of the export market. 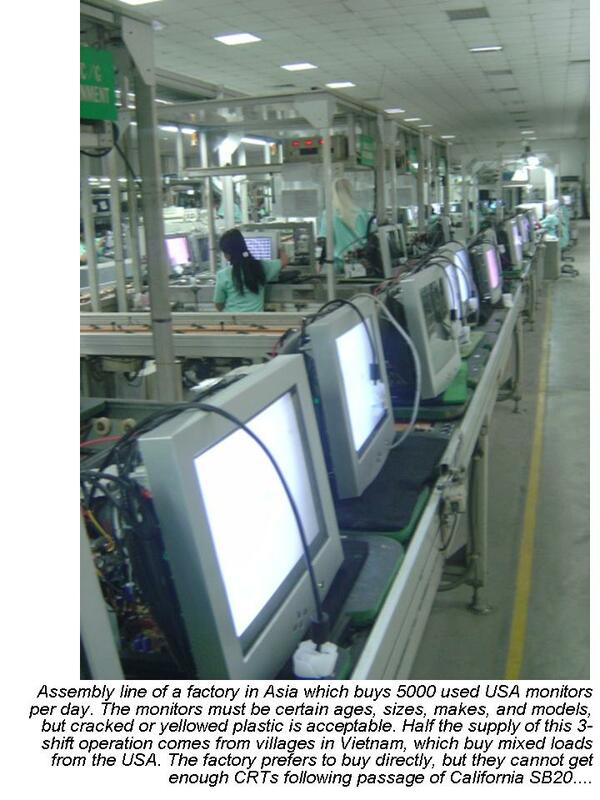 A huge part of this has been to locate original equipment assembly factories (the ones which made monitors for name brands in the past), identify them as careful importers of working and refurbishable equipment, and create fair trade incentives for them. The second hardest thing we face is to convince our clients that these are not primitive, dirty polluting factories like the yards shown to CBS 60 Minutes. The hardest thing has been to work with them transparently while not inviting a direct attack, either from planned obsolescence interests, by single-issue environmental organizations without wherewithal to do downstream audits, or by our competitors who have invested in shredding and "zero reuse, no-intact-unit" programs. Some have said I have invited attacks like the one on the factory in Indonesia by being transparent. But I already saw refurbishers shut down in Cairo and Mexico who were doing nothing wrong, and I expected the attacks on Asian contract manufacturers. So what I've been doing is to get the story out there BEFORE the audited factory is attacked. We had NPR Living on Earth tour Mexico BEFORE their import permit (legally activated) was revoked. Environmentalists are murdering sustainability. They have gone so far in doing it that they are starting to come up with alibis. We are working very hard to come up with compromises and to stay a step ahead. 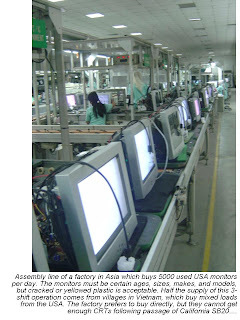 But rules like "monitor original manufacturing date less than 3 years" is a joke, the monitors aren't even SOLD for 6 months after their manufacture, and everyone knows CRTs last 20-25 years. What I am trying to do is nearly impossible, working against OEMs who fight secondary markets, environmentalists who have press credentials, and well-capitalized recycling competitors with million dollar shredding machines. But unless they kill me personally, this story is being documented and will be written, and the blood and toxins from mining and virgin production will be recorded like. Here is a write up of the city where our main factory partner is located. One of Asia's first "Carbon Free Cities". Let's take their reuse and refurbishing jobs away, let's tell our friends we are green after doing it, let's show ten year old pictures of Chinese peasants burning wire to describe them. No one will ever know. Penang Global City Center (PGCC) is built in 260 acre Penang turf club soon will be launched in Penang island of Malaysia. It has two towers of more than 200 mts, and designed by two architects from New York and Paris. A 26 acre Park and road is developed first to smoothen traffic flow of the Project. 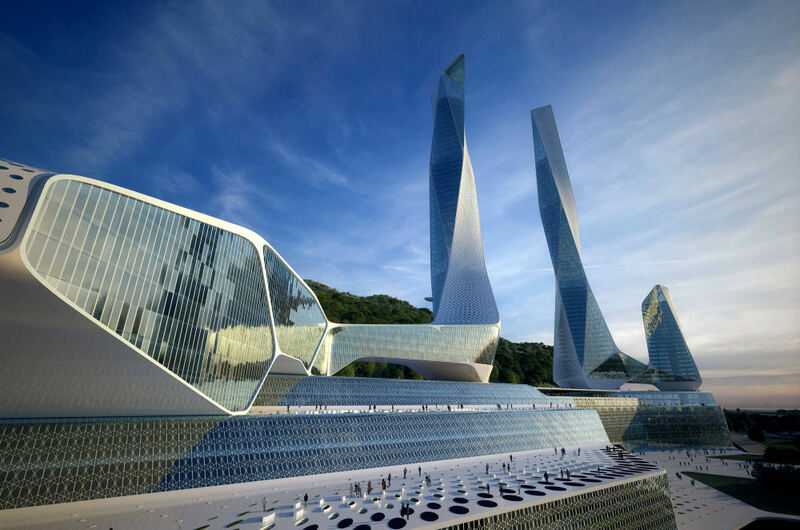 This tower is built as CARBON FREE CITY with two 5 star hotels, commerical and residential properties and state of the art Cultural center…the design is made to blend the building with surrounding hills and greenary and it took 4 years to design it..